The first thing you need to know about Puerto Morelos is that we are a very small community. Located just south of the Cancun Airport, at the beginning of the Mayan Riviera, this town of about 10,000 people is one of the oldest along the Mexican Caribbean coast. The port in Puerto Morelos was originally used to export chicle. Chicle was the gum base taken from the Manilkara chicle, a tropical evergreen tree native to the area. There were five narrow guage rail lines which used to run from different areas in the Yucatan into Puerto Morelos’ main town square. This, along with the excellent fishing off of our coast made PoMo the place to be before Cancun or Playa del Carmen were even thought of. Today, the town still remains small and relatively undiscovered despite the rapid growth around it. Perfect if you want a place to relax and enjoy the white sand beaches without the crowds. Puerto Morelos is located a very short boat ride from the Palancar reef, the second largest reef system in the world, giving us amazing diving, snorkelling and fishing. 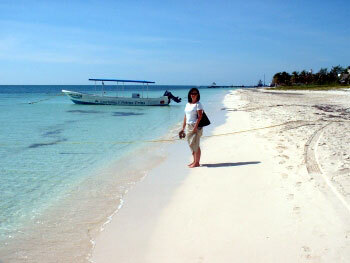 The reef directly in front of Puerto Morelos is a national park. By protecting the reef we have preserved its fish and corals. Puerto Morelos also offers some of the best restaurants in the area. With over 40 different dining locations, you will find something to suite everyone`s tastes. From fresh fish to great steaks to yummy desserts, we have it all. Haven’t been to Puerto Morelos is a while or not at all? Here are a dozen good reasons why you should visit this charming little fishing village. Puerto Morelos’ most spectacular attraction is its reef filled with hundreds of varieties of fish, sea life and corals. This underwater playground is located directly in front of the village. PoMo is a marine Reserve so snorkeling at the reef must be done with a guide. There you can see rays, lobster, eels, nurse sharks, turtles and more. For scuba divers there are many different dive sites including a sunken military ship with swim-throughs. Puerto Morelos boasts the largest English bookstore on the peninsula. What better way to relax, unwind and enjoy the sun than with a great book. Alma Libre Bookstore, located on the central square, has more than 20,000 new and used books to choose from including: Mayan culture and cooking, how to learn Spanish, travel and nature guides plus maps of the area. You can explore the plants and animals of the area by visiting either Crococun and/or the Jardin Botanico. If you want to get close to nature, really close, then Crococun is a must. Despite its rather cheesy name, it is a great adventure. 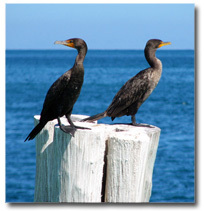 Admission prices include your own private guide who will introduce you to the wildlife of Puerto Morelos. To see the native plants of the area visit the 150 acre Jardin Botanico. Three kilometres of pathways lead you through the lush grounds with plants labelled in both English and Spanish. Watch out for the monkeys! They usually swing by in the afternoon. Puerto Morelos offers world class fishing for Marlin, Sailfish, Dorado (Mahi mahi), Bonito and Barracuda. Tours can be arranged through the local dive shops, right on the pier or by contacting Diving Dog Tours (bocapaila@yahoo.com). Two large fishing tournaments are held every May and June. If you’d rather let someone else do the fishing for you, stroll to the fish co-operative on the square which reels in the catch of the day for a low price. What better reason to go to the jungle than to relax and get a Mayan massage. The Jungle Spa has “the” best massages in the area. And every Sunday (during the season), at the same location you can visit the Mayan Jungle Market. This is your chance to buy unique handicrafts directly from Mayan artisans, plus enjoy fine food and learn some traditional Mayan dances. If you are looking to expand your horizons you could try learning Spanish. PoMo has lots of excellent Spanish teachers. Or you could become a better cook by taking a class at the Little Mexican Cooking School. With miles of white sand beach and turquoise water stretch along the Caribbean coast, Puerto Morelos is one of the few places left where you can walk for hours. Dotted with natural sea grass, exotic sea shells and scurrying Sandpipers, a stroll along the coast line is a great way to wash away your stress. Shopping in Puerto Morelos comes without the hassle of “Come On… Take a Look.” Several shops carry hammocks, clothing, jewelry, art and more. For locally made crafts, you can visit the Mayan Handicraft Centre where you can see local artists working in their shops as they create something special just for you. A Pleasant Surprise…. Puerto Morelos offers world class cuisine! In this little town you will find some of the best restaurants in the Yucatan. There are excellent coffee houses and restaurants. You can indulge your taste buds in home cooked Mexican, Argentinian empanadas and steaks, fresh Italian pastas, Greek delights and of course fresh seafood. Plus you may find a bar or two where you can enjoy a drink and listen to live music. 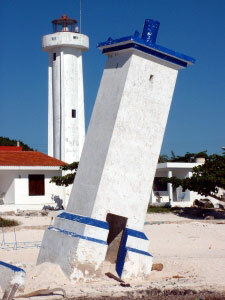 Ravaged by a hurricane in 1967, Puerto Morelos’ old light house now leans heavily in the sand in front of the new lighthouse. Since then it has survived a handful of hurricanes and became our town symbol. To take a really great photo, walk out to the end of the dock and look back. With over 150 species of birds calling the Mangroves & jungle their home, it’s a great place to see birds and wildlife you have never seen before. Along the crowded Mayan Rivera, Puerto Morelos is a quiet departure, where life moves slowly and stress is a foreign concept. It’s a great place to work on your Spanish, get a massage, take a yoga class or just hang out in a hammock. This guide brought to you by InPuertoMorelos.com. Other cool things. Check out cenotes (underground rivers and lakes) on the nearby Ruta de Cenotes. Ride a zipline in the jungle. Take a tour to the ruins or Rio Lagartos to see birds and crocodiles.